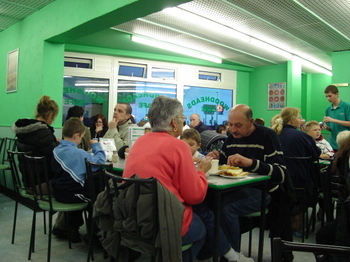 There must be a ton of great cafes in Blackpool, but we weren't there for long and we had to plump for one. 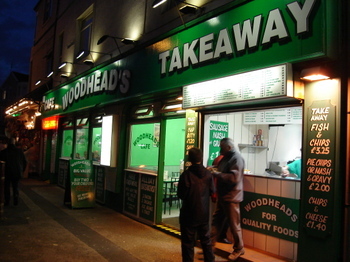 And I think we got very lucky, because Woodhead's is a fantastic place. The ebcb is splendid. It had a marvelous efficient crispiness. Crispy bacon, crispy eggs, bitey, crunchy chips. 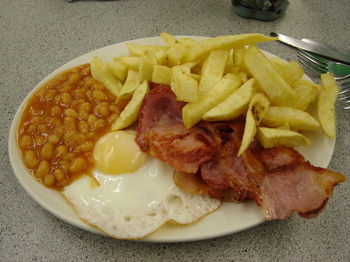 Beans, not really crispy, obviously, crispy beans would be weird, but delicious. It's a big place. Dead busy when we were there. It's right next to the Pleasure Beach, which had just closed, so they're obviously busy a lot and they'd developed an efficient friendliness which worked very well. I guess in a location like that you have to get good quick. Big. Value. 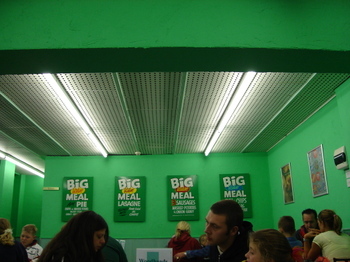 Meal. The three most beautiful words in the English language. They've picked a colour and they're sticking with it. Admirable focus and consistency. 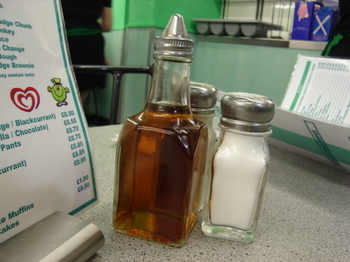 Simple chip-shop condiments. Your sauce comes in sachets. That'll do me. And a handy outdoor bit for take-aways. What a brilliant place. Must go back to Blackpool. That green colour inside is brilliant. Hi Russel, love the web site. You're getting quite famous too. There was a question on the Weakest Link the other night asking something like "In reference to Russel Davies' book, what does EBCB stand for?'. Surely you're kidding about The Weakest Link, aren't you? That is fame indeed. Great site! brougth me lots of things i lived (and eated) when in London. Greetings from a Spanish bloke that went to uk for 6 months and stayed 5 years. I loved it. I now live in Valencia, Spain and work as a movie translator, but who knows? I may come back. Oh, you just reminded me of my diet. Wow, that looks like a really fun place. I like the green as well! 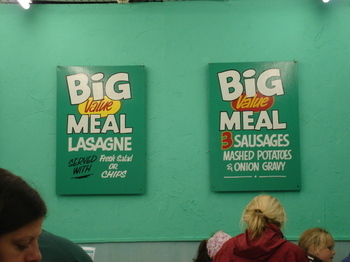 Their value meal looks really fantastic. I should go eat right now, goodbye. Damn you! damn myself rather, i've not checked this fantastic site for a number of weeks, and have just got back from a quick weekend away in blackpool and have missed out on what looks like a mighty fine establishment. I just adore this blog, a guilty pleasure of mine. Look forward to future updates! Great place, I love to eat.. any place that has great food is two thumb up for me..
Burgers... fries... food I love to indulge in! Perfect treat. 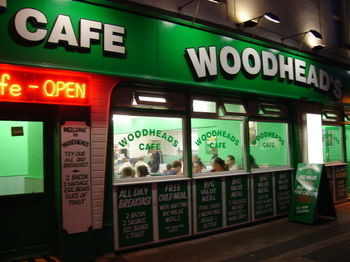 I am the owner of Woodheads Cafe and would just like to say thanks for your comments. We work really hard and its nice to know its appreciated. PS What date did you come ? Hmmm. In a London caff you don't like sauce in a sachet but up North "That'll do me. ".